When I was cut back to two days of work in May 2016, I felt as if my world were shattered. Just by happenstance, within a week or two, I found myself at the Los Angeles Central Library at 5th and Hope downtown on a Thursday. Every Thursday at 12:30 pm, the UCLA Mindful Awareness Research Center (MARC) gives a guided 30-minute meditation in Conference Room A. I have come to depend on these Thursday sessions, plus my own efforts at meditation whenever and wherever, to give me a feeling of living in the present moment and enjoying glimpses of happiness. I have also read several books by the Vietnamese Buddhist monk Thich Nhat Hanh, most recently No Mud, No Lotus: The Art of Transforming Suffering and also The Art of Living. According to Thich mindfulness is the key to enjoying such happiness that we can experience in this life. Maybe intellectually people know that they should live in the present moment, but the habit energy that has been there for a long time is always pushing them to rush around, so they have lost their capacity to be in the present moment in order to lead their life deeply. That is why the practice is important, and talking is not enough. You have to practice enough to really stop your running around so that you can establish yourself in the present moment. That is the very beginning of the practice: stopping. Stopping, looking deeply, and finding happiness and liberation—that is the Buddhist path. Suffering and happiness inter-are. We can recognize happiness only against the background of suffering. It’s like when you recognize the white against the background of the black. Only if you have been hungry can you experience the joy of having something to eat. If you experience the suffering of war, you can recognize the value of peace. Otherwise, you don’t appreciate peace, and you want to make war. So your experience of the suffering of war serves as the background for your happiness about peace. Therefore, to have some suffering is very important. You learn from suffering, and against that background, you can recognize happiness. There is a deep tendency in us to seek pleasure and avoid suffering. It is rooted in the store consciousness, called manas in Sanskrit. Manas is always seeking pleasure and trying to avoid pain and suffering. Manas isn’t aware of the danger of pleasure-seeking because there is ignorance in manas. It is like a fish who is about to bite the bait and does not know that inside of the bait there is a hook. Manas isn’t aware of the danger of pleasure and does not know that suffering has its own goodness. It is good to experience some suffering, because when you suffer you develop compassion and understanding. If you are interested in the simple practices that have meant so much to me in my recent life, I suggest you check out the website of MARC at http://marc.ucla.edu/. 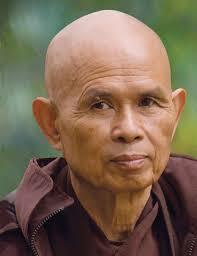 And see if you can find any of Thich Nhat Hanh’s books. This entry was posted in religion and tagged mindfulness, thich-nhat-hanh. Bookmark the permalink. Mindfulness has been one of those “on again, off again” issues with me. I start but soon get distracted by the world, if you know what I mean. Maybe it’s time to start again, and maybe it’ll stick this time.